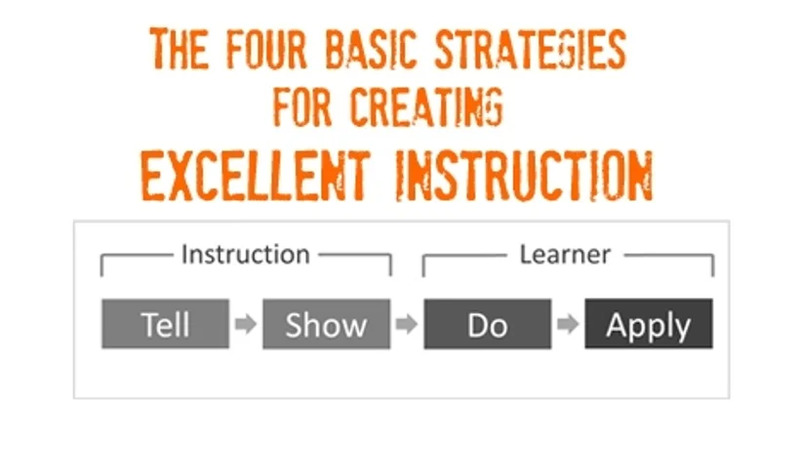 The first component of good instruction is the Tell strategy. This is the strategy used to provide the learner with key information related to their learning. Facts, concepts, rules, and procedures can all be conveyed using the Tell strategy. For example, if you were designing instruction to teach customer service representatives how to offer a new product to their existing customers, you would tell them the specific steps they would go through to offer the product and even show a visual outline of the steps. The second component of good instruction is the Show strategy. This is the strategy used to demonstrate examples of what you want to teach. In the customer service example, you would show a variety of real examples of an agent offering the product to the learner. You would probably show "non-examples" as well- examples of what not to do when offering the products. These examples will help the learner see how the information you told them is applied. After providing a variety of examples, you should provide your learners with the opportunity to Do what you have taught them. In the customer service example, the learners take several calls with actual customers and offer them the product. Trainers and managers listen in on these calls and provide the learners with feedback and guidance. It is important that learners be given plenty of feedback as they apply what they have learned so that they can improve their skills and abilities. As in this example, the is application of the new knowledge should replicate the real-world environment as much as possible to make the learning experience authentic and engaging. The final component is Apply. In this step, learners plan out how they will apply their knowledge in their own environments. In the customer service example, the learners plan out their own personalized scripts for specific situations and set goals for offering and selling products to their clients.